ERIKS, as a prominent industrial supply partner, is now able to prevent pollution and out-gassing of components by using its own cleanroom. 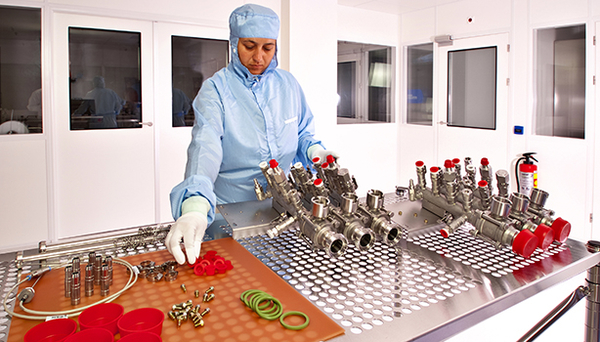 Inside this cleanroom we clean hoses, seals, industrial plastics and valves in different ways. We make these products dustproof after which we pack them in the best possible way. Tight procedures and working instructions guarantee that our products are cleaned and packed under the best possible circumstances. The size of a human hair is 100 µm on average. Nowadays it is possible to filter up to 0.5 µm with very good results and relatively little effort. This filtering takes place in the cleanroom. This sealed space is filled with air in which only a limited number of particles, with a size of 0.5 µm or more, float about. The current norm for the industry is ISO 14644-1. Within this norm Eriks uses ISO class 7 (also known as class 10,000) for her cleanroom. The cleaning and packing takes place in an, even tighter, class 100 environment which is accepted by 90% of the industry. ERIKS is fully equipped to take over your cleaning and packing activities in one’s own cleanroom. Out-gassing of rubber products by means of vacuum ovens is also an added ERIKS-value to the market. This applies for ERIKS as well as non-ERIKS products and could amount to attractive savings in time and money! If you want to receive more information about ERIKS Engineered Plastics, fill in the fom on the right of the page or contact a local team. Click here to find your nearest ERIKS Engineered Plastics location.